Equipment: satellite TV; internet access Wi-Fi (included); washing machine; air conditioning (not available in all rooms); oil central heating. Furnishing: holiday standard, homely, tiled floor, parquet floor. Please note: Owner lives at floor 2. apartment, 4 - 6 people, 3 room/s, 2 bedroom/s, 1 bathroom/s, approx. 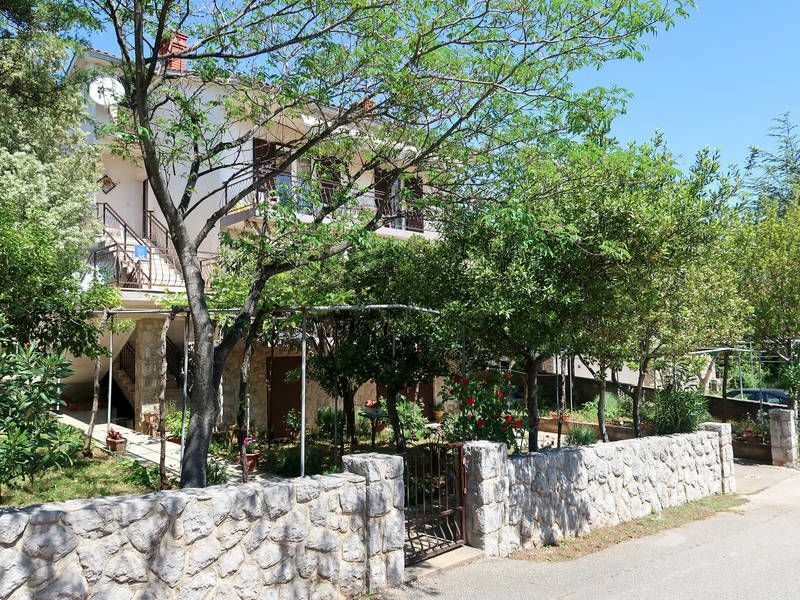 70 m², 1 floor/s, apartment on floor 1, separate access to the property, via external stairs. Kitchen: Kitchen/ cooking equipment: 4 ceramic hobs, oven, dish-washer, combination fridge-freezer, coffee machine, water boiler, toaster. separate, exit to balcony. Living room/bed room: 2 x sofa bed, exit to balcony. Estate: (shared use): approx. 600 m², closed plot (fence, wall), in a hillside, trees, with plants, with garden, well-kept. Situation: suburbian area, residential area, holiday village, on an island Krk. Plot description: 1 x parking on the estate; parking on the road near the house. terrace 20 m², balcony 14 m² (sun-blind), furnishing provided, transportable barbecue. Arrival: Airport Rijeka/Krk in approx. 31 km. Beach/waters: Pebble beach in approx. 1.2 km. Sea in approx. 1.2 km. Next village/town: Center Krk in approx. 5 km. Kornic in approx. 500 m. Punat in approx. 3.5 km. Shopping: Next shopping possibility (Kornic) in approx. 500 m.